On Thursday, July 23rd, from 7:00 - 8:00 PM, I officially launched my latest book, The Reason for Flowers, at the Changing Hands bookstore in Phoenix, Arizona (300 West Camelback Road). I presented an illustrated slide talk on the five major themes in the book, some examples from the book, a selection of my still photos and a time lapse video, along with how I came to write the book. Afterwards, I gave three short readings, one from the Preface, one about enticing orchids bees to visit a rare bucket orchid flower (Coryanthes) as part of my bee wrangler and Disneynature Chief Scientist duties for the Louie Schwartzberg feature film "Wings of Life" partially filmed on location in Panama, and a final reading about "Arriving by Jumbo Jet" detailing how cut flowers grown in Columbia arrive by the millions at the Miami airport. After these formal presentations I opened the discussions up for a lively Q&A with about 40 attendees. Everyone had a great time and there was time for book signings and further chats after the formal event. This was my very first time in this incredible bookstore, an AZ original and unique venue. Not only is this a full service bookstore with an extremely friendly and helpful staff, but adjacent to the bookstore is a restaurant and a garden shop. Inside Changing Hands is a full service bar and plenty of tables, free Wi-Fi, and places to linger with a print book or an e-book. That night the bar was serving a special drink, a "Crispin Blackberry Pear Cider," which I can attest was a very tasty and fitting drink for the evening since pollinators visiting flowers bring us not only one of every three bites of food we eat, but also the berry and fruit flavors that go into most of our favorite juices and alcoholic beverages. Go pollinators! 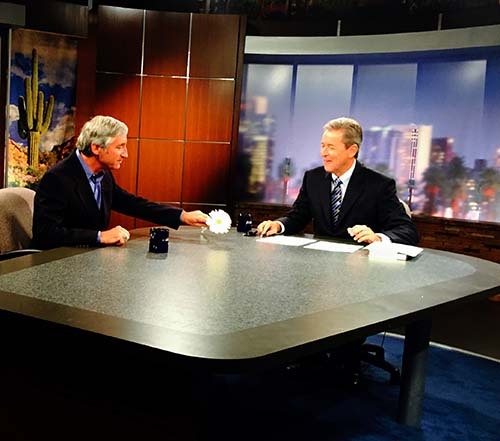 During my official AZ Book Launch Week (staring with the publication date of July 21st) I gave an interview on NPR's All Things Considered along with a KUAT AZ Spotlight radio interview and several television interviews in Phoenix. A photograph of me presenting Ted Simons, host of "Arizona Horizon" (KAET) with a Gerbera daisy can be seen above. You can find videos of these various shows as links on the Media & Events page of my website. Stay tuned for further media and events about the release of my new book. Lavender wholeale flowers are exotic, andd symbolize a love at first sight enchantment and is a very appropriate color or flower for a wedding. Choosing what kind of compay or online business to be created depends onn the current situation of the retailer annd is a very important dechision that will affect the bottom line of the business. Most of them have foun success out of their business.